Brushes are not only used for applying paints on a canvas. There are also special brushes which enable an user to create real pieces of art on one’s face. The question, however, is which brushes to buy to produce these work of art? How to choose make-up brushes? All make-up brushes differ in terms of sizes, purpose and angle at which the bristle is cut. This accessories have to be picked in such a way to avoid all possible stains and smudges from appearing on our face while applying make-up. The basic set of make-up brushes consists of a powder brush, a foundation brush, a blusher brush, a concealer brush, an eye shadow brush and a lipstick brush. What is more, a high quality brushes should be made from natural bristle (can be recognized thanks to softness), yet fairly effective are also brushes made of synthetic materials. However, in both cases, the tip of a brush should stay compact and dense. How to cleanse make-up brushes? Make-up brushes must be cleansed frequently just to prevent all bacteria from multiplying. Dirty make-up accessories contribute to development of skin imperfections like acne, discolourations and even skin allergies. For example, brushes can be put inside a dish filled with a mixture of water and soap, and left aside overnight. Then, they have to be removed from water and placed on a towel to make them become air-dried. In order to speed up the process of brushes drying-out, it is suggested using paper towels. However, remember that brushes must not be exposed to hot air produced by a blow-dryer. The easiest way of making all the bruises perfectly clean again is just spraying them with a special disinfecting preparation. 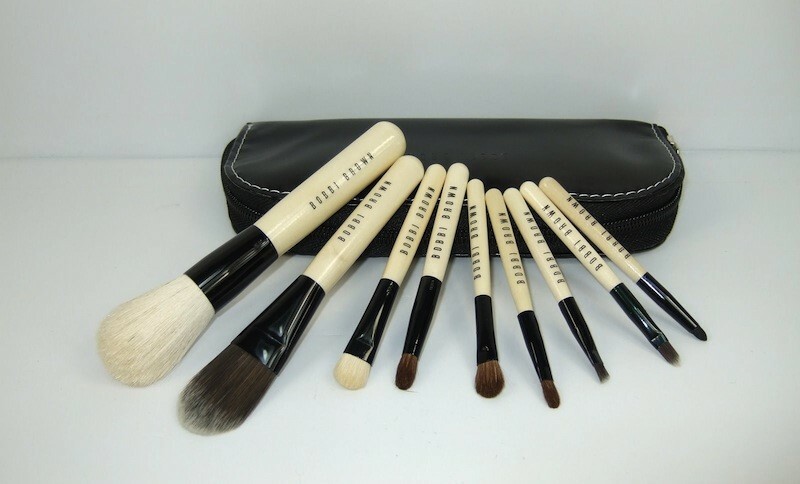 Bobbi Brown Make-up Brushes Set. Bobbi Brown brand has prepared a perfect travel set of make-up brushes. The accessories are placed inside a small, leather case. The set contains seven brushes designed for applying a powder, a blusher, a foundation, an eyeshadow, a lipstick and for applying eyelines. The bristle of all brushes is soft and delicate. What is considered as a huge advantage of the accessories, the brushes do not loose their bristle. Last but not least, the handles are cambered just perfectly, therefore, they lie in a hand so comfortably. This entry was posted in Care and tagged Bobbi Brown, brush, brushes, Make-up, set, travel. ← What the Nanolash Serum is and my experience with it.